I came to the realization tonight that the end of winter is coming up on us quickly and I haven't reviewed anywhere near enough dark beers. 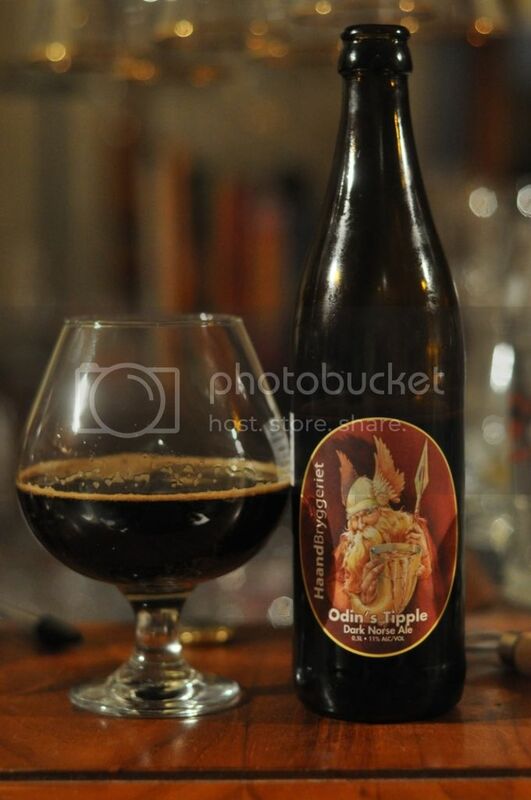 So up steps HaandBryggeriet and their Odin's Tipple. This is a big American Imperial Stout, which has a ratebeer score of 99! It should be a ripper! HaandBryggeriet have had one beer reviewed here before, the Dobbel Dose IPA (which you can read here). The only concern I have with this beer is that the alcohol that was so present in the IPA may ruin what is by all reports a brilliant beer. Hopefully I'm wrong and the volunteer brewers at HaandBryggeriet come through again. This beer has one of the darkest heads I have ever seen, it's a shame that the head doesn't last for long enough for you to see it in the photo. It's also about as black as any other stout I've ever seen, absolutely no light can get through this one. The carbonation is probably quite poor as you require alot of swirling to get any sort of head. Anyway the stout looks reasonable, hopefully it tastes as good as what I've been told. Odin's Tipple has a nose full of dark chocolate malts up front. It's a hugely impressive nose with with almost every element I look for in a stout present. There is not only the chocolate malts, but also some spices, smokiness and sweet caramel aromas. It almost smells like it's been barrel aged, it's got a really nice nose which is living up the reputation this beer has accrued. I say this quite alot but this is a seriously good beer! At first the malts just blast your taste buds with a huge hit of chocolatey smokiness. As the beer warms caramel and licorice flavours become more prominent as do some spices and dark fruit flavours. The beer drinks more like a dark ale than a stout, it's quite light and the booze of the Dobbel Dose is but a forgotten memory. This is a simply wonderful stout! The back of the label tries to instill the image of Odin, the norse god of thunder, drinking this in his later contemplative days. This beer embodies everything that makes Odin great! It's a big brash stout upfront in honour of his position as the god of victory, battle and war, while it also has a more complex side signifying his own more complex side as the god of poetry, wisdom and prophecy. I think the name perfectly instills the idea that the brewers were aiming for. This is a delicious winter stout that I will definitely be buying more of and I think all of you reading this should as well!